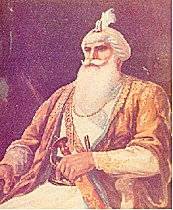 However such was the admiration he won of the whole Sikh community that Jassa Singh kalal came to be known as 'Guru Ka Lal' (the beloved son of Guru). Son of Badar Singh Jassa Singh was hardly 5 yr. old when his father died (1723 A.D.). His mother entreated Mata Sundri, widow of Guru Gobind Singh ji, to take him into her care. Mata Sundri agreed to do so, and lavished much affection on him, instructing him carefully in the arts of war and peace. He studied Sikh scriptures under Bhai Mani Singh. Later, Mata Sundri asked Nawab Kapur Singh to take charge of the promising youth. Both he and hismother used to perform Hari-Kirtan before Nawab Kapur Singh, who much pleased at his supreme devotion to the faith and sense of duty and humility, appointed him as a storekeeper with his forces. As was natural, he participated in many combats as well where he displayed such qualities of leadership that Nawab Kapur Singh appointed him his successor on the eve of his death in 1753. Elated at his successful helmsmanship, the Khalsa honored Jassa Singh with the title of Sultan-ul-Qaum (king of the whole people), when they captured Lahore in 1761. On Feb 5 1762, Sikhs were especially the target of Ahmad Shah Abdali Sixth invasion into India. News had reached him in Afghanistan of the defeat of his general, Nur-Ud-Din Bamezai, at the hands of Sikhs who were fast spreading themselves out over the Punjab and had declared their leader, Jassa Singh Ahluwalia, king of Lahore. To rid his Indian dominion of them once for all, he set out from Kandahar. Marching with alacrity, he overtook the Sikhs, as they were withdrawing into the Malwa after crossing the Sutlej. The moving caravan comprised a substantial portion of the total Sikh population and contained, besides active fighters, a large body of old men, women and children who were being escorted to the safety of the interior of the country. Surprised by Ahmad Shah, the Sikhs threw a cordon round those that needed protection, and prepared for the battle. In this formationand continuing their march, they fought invaders and their Indian allies (Nawab of Malerkotla, Sarhind, etc.) desperately. Charat Singh, Hari Singh Bhangi and Jassa Singh Ahluwalia led their forces with skill and courage. Jassa Singh Ahluwalia sustained sixty-four wounds on his body and Charat Singh rode to exhaustion five of his horses one after another. Ahmad Shah succeeded, in the end, in breaking through the ring and glutted his spite by carrying out a full-scale butchery. His orders were for everyone in Indian dress to be killed at sight. The soldiers of Malerkotala and Sarhind were to wear green leaves of trees on their heads to distinguish themselves from the Sikhs. Near the village of Kup, in the vicinity of Malerkotla, about 20,000 Sikhs lay on that ghastly field at the end of a single day's action (February 5, 1762). This battle in Sikh history is known as Wadda Ghalughara. Jassa singh fought valiantly and received 64 cuts, but he survived. Even such a disaster as had overtaken them at Kup caused no despondency among the Sikhs. When the survirors of of the Great carnage assembled in the evening for their prayers. A Sikh got up and said "No harm done, Khalsa ji! The Panth has emerged purer from the trial; the alloy has been eliminated." 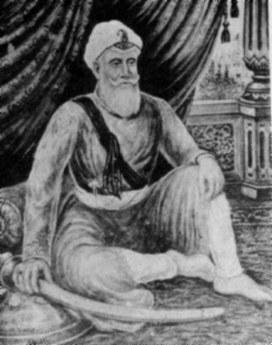 Within four months of Ghalughara, Sikhs under Jassa Singh Ahluwalia inflicted and a severe defeat on the governor of Sarhind and were celebrating Diwali in Harimandir which the Shah had demolished, and were fighting pitched battle forcing him to withdraw from Amritsar under cover of darkness (October 17,1762). Up to now, Sikhs forces were divided into 65 jathas Nawab Kapur singh reorganized them into Eleven bands, each of course with its own name, flag and leader. These bands or Jathas, which came to known later on as Misls (lit. equal, also an example) together were, however, given the name of Dal Khalsa (or the Khalsa force), under over all charge of Jassa Singh Ahluwalia. The fear of his Indian empire falling to the Sikhs continued to obsess the Ahmad Shah Abdali's mind and helet out another campaign against Sikhs towards the close of 1766. This was his eighth invasion into India. The Sikhs had recourse to their old game of hide and seek. They vacated Lahore, but faced squarely the Afghan general, Jahan Khan at Amritsar, forcing him to retreat, with six thousand Abdali's soldiers killed. Jassa Singh Ahluwalia with an army of about twenty thousand Sikhs roamed in the neighborhood of the Afghan camp plundering it to his heart's content. Never before Ahmad Shah Abdali had felt so helpless, his dream of capturing the whole of India was dying before his own eyes. In the words of a contemporary writer: "The Shah's influence is confined merely to those tracts which are covered by his army. The Zamindars appear in general so well affected towards the Sikhs that it's usual with the latter to repair by night to the villages where they find every refreshment. By the day they retire from them and again fall to harassing the Shah's troops. " Jassa Singh was also called "Bandi Chhor", (The delivered) for having rescued 2200 beautiful Hindu women made prisoner by Abdali for his harms.